Moist to wet. Meadows, floodplains, marsh edges, streams. Full sun to light shade. This is a fast growing, short lived, shrub rising on multiple stems from shallow roots and stolons. Individual plants usually live 3 to 5 years and are replaced by new plants rising from the same rootstock. 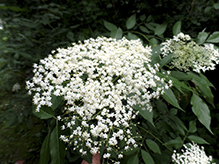 The stems are erect or arching, branching, hairless, up to 12′ tall, and up to 3½″ in diameter at breast height. They are brittle, weak, and dotted with conspicuous, large, raised, warty bumps (lenticels). 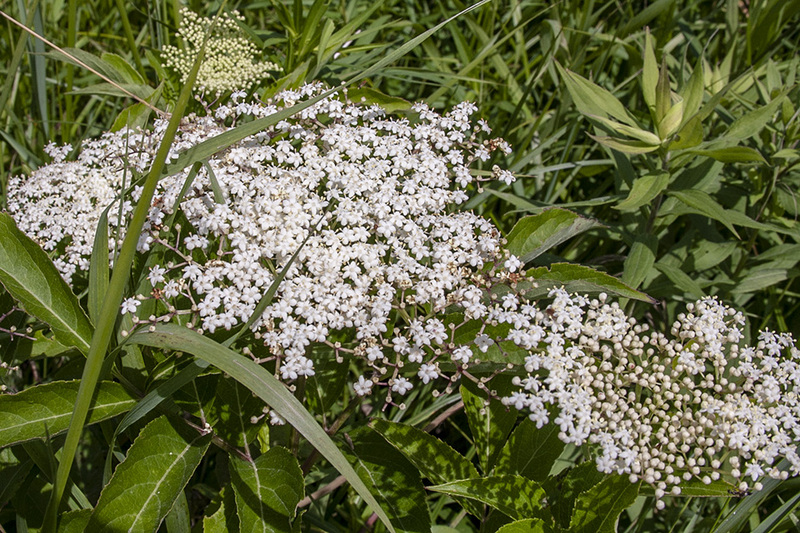 First year stems and twigs are green, smooth, and sometimes covered with whitish, waxy bloom (glaucous). Second year stems and twigs are grayish or yellowish-brown, woody, and rough. The twigs are stout. The area of cells in the center of the stem (pith) is large, encompassing more than half of the diameter of the twig. The pith is pure white in both first-year and second-year twigs. Lateral buds are reddish-brown, small, cone-shaped, and somewhat depressed. There are no terminal buds. 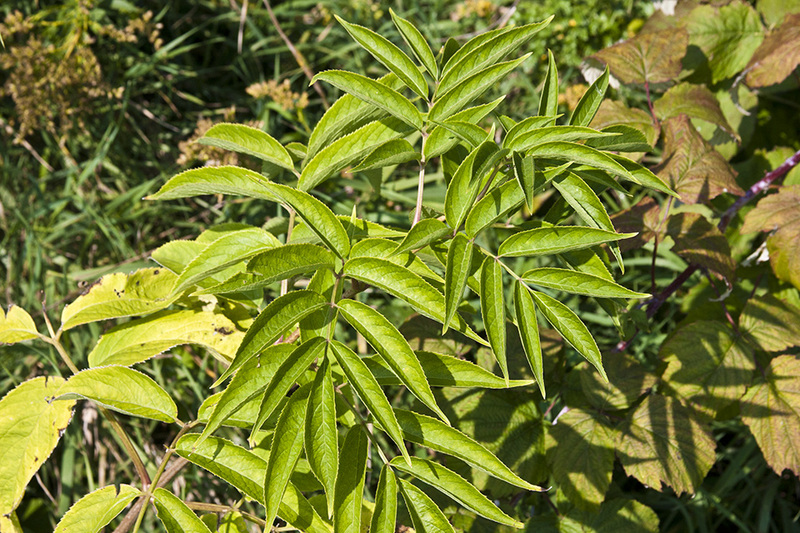 The leaves are opposite, deciduous, and pinnately divided into usually 7, occasionally 5 or 9, sometimes 11, leaflets. They are attached to the twig on a 1¼″ to 2¾″ long leaf stalk. The upper surface of the leaf stalk is channeled. The channel is hairy but the leaf stalk is otherwise hairless. The leaflets are lance-shaped to egg-shaped or elliptic, 2″ to 4¾″ long, and 1″ to 2¼″ wide. They are either stalkless or are attached to the central leaf stalk (rachis) on a leaflet stalk no more than ¼″ long. They are rounded or tapered and symmetrical at the base and taper to a point at the tip with concave sides along the tip. The terminal leaflet is often somewhat larger than the lateral leaflets. The upper surface of the leaflet is dark green, and sparsely hairy, at least along the midvein. The lower surface is pale green and hairy along the veins. The margins have fine, sharp, forward-pointing teeth. 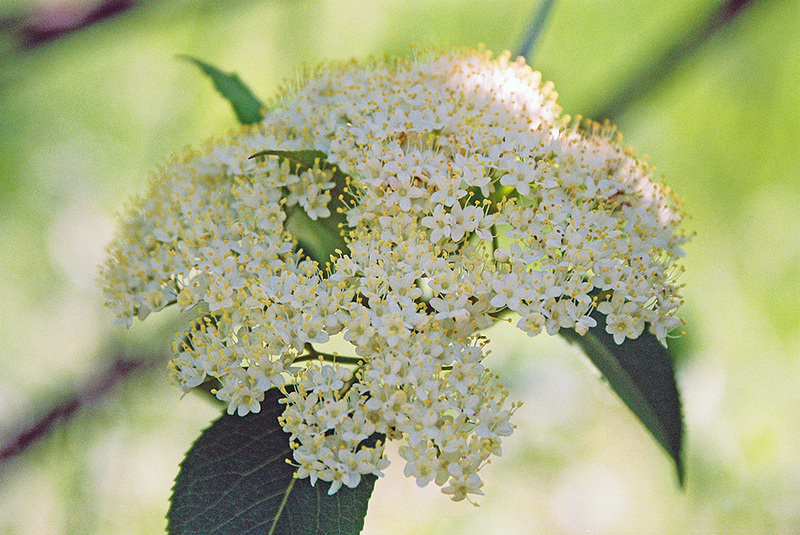 The inflorescence is a branched, 3½″ to 7″ wide cluster (cyme) at the ends of the stems and branches. The cymes are flat-topped and much wider than long. They rise on erect, 2⅜″ to 5½″ long stalks that branch at the tip into 5 rays. 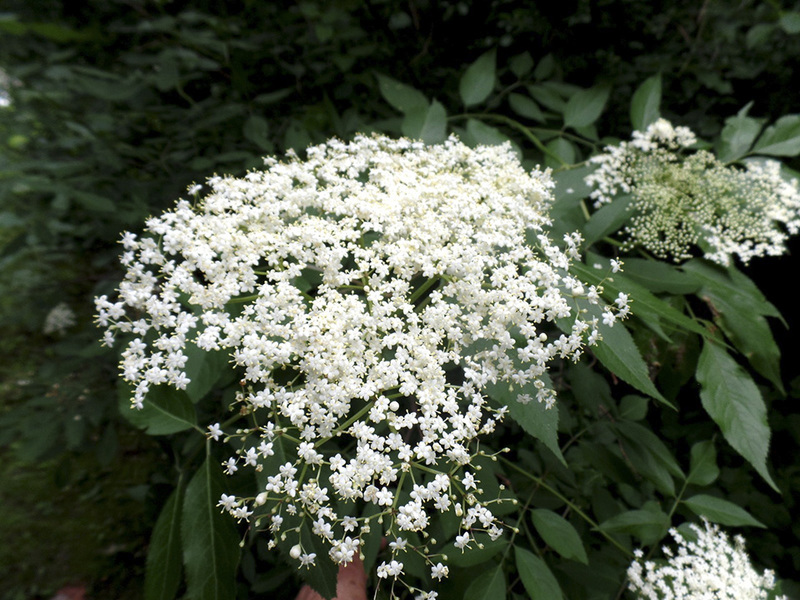 Each cyme has 200 to 400 small flowers. The flowers are about ¼″ wide. 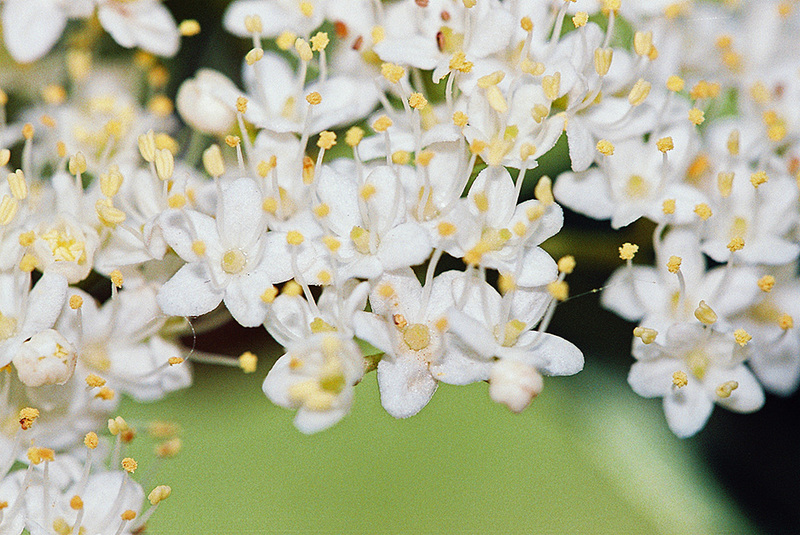 There are 5 white petals and 5 stamens with white filaments and yellow anthers. The flowers have a musty fragrance. They appear in early July to mid-August. The fruit is a juicy, globular berry, about ¼″ in diameter, containing 3 to 5 seeds. 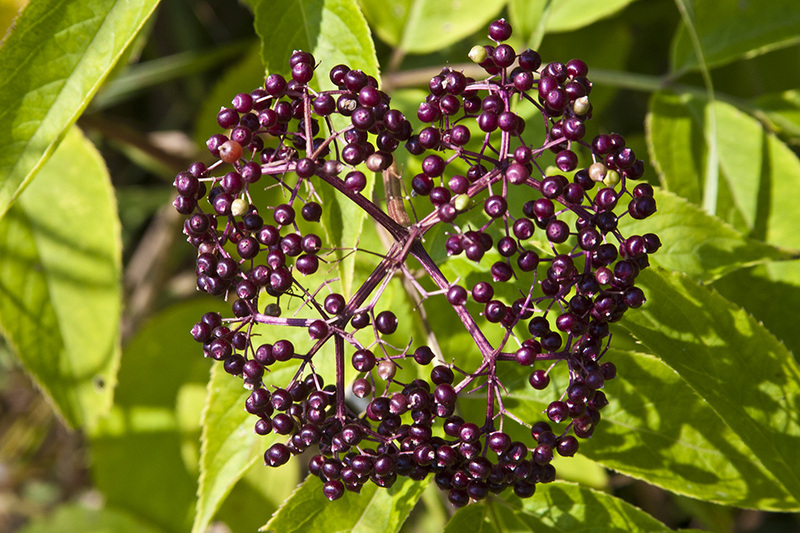 It ripens in early August to mid-September turning dark, blackish-purple. 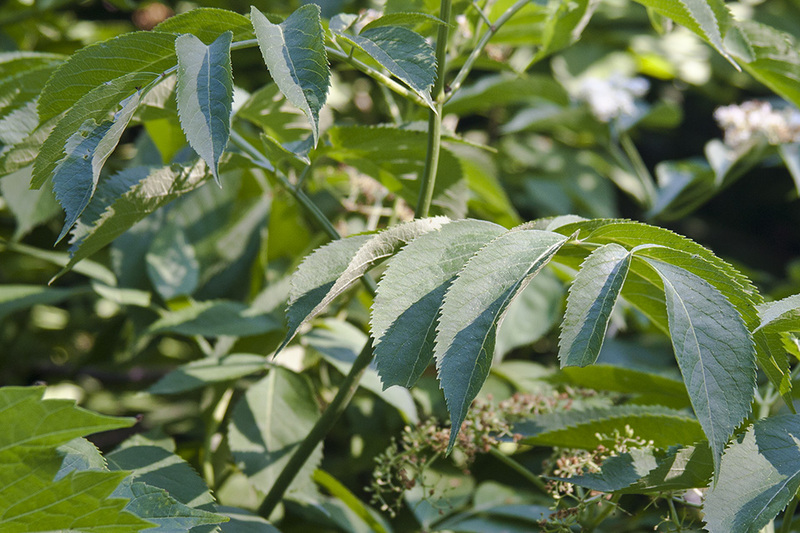 Nannyberry (Viburnum lentago) has undivided (simple), hairless leaves. 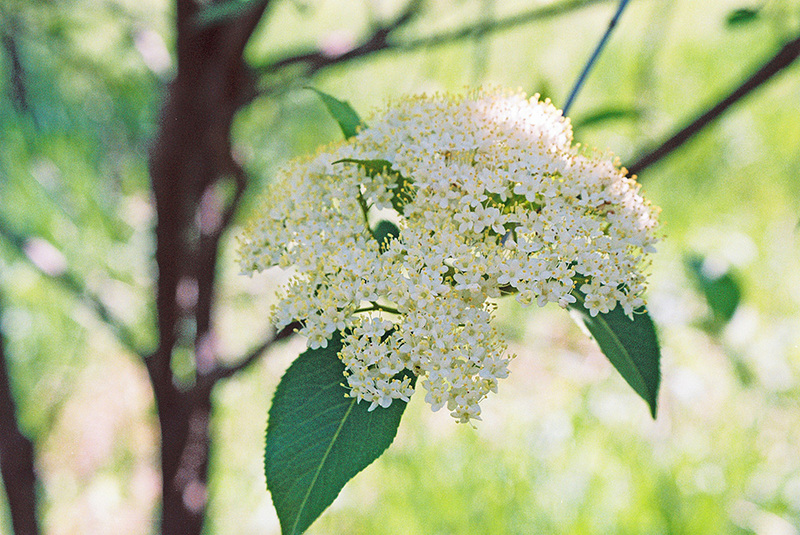 The inflorescence is smaller, 2″ to 4″ wide, and round-topped. 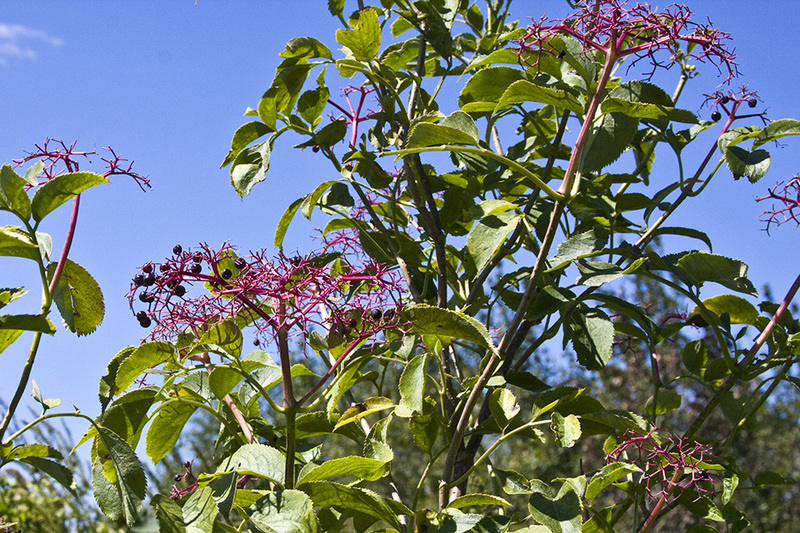 Red elderberry (Sambucus racemosa var. racemosa) second year twigs have brown pith. 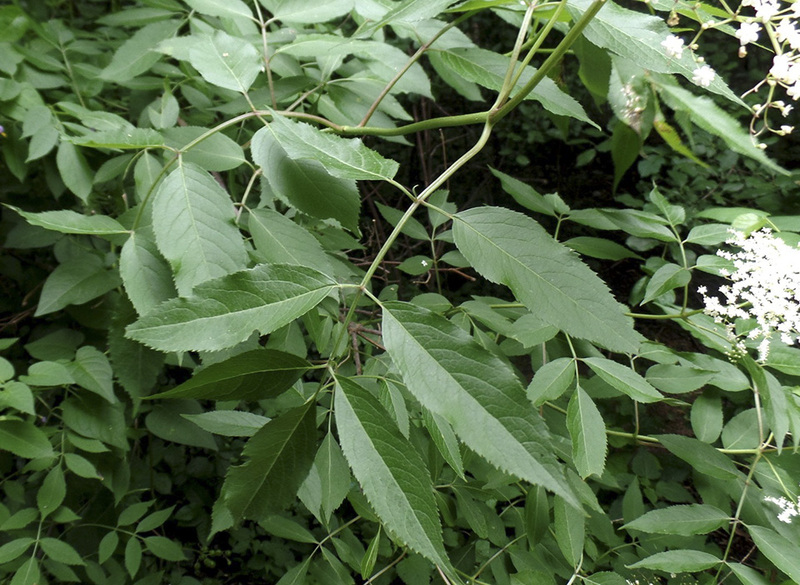 The leaves usually have 5 leaflets, occasionally 7. The leaf stalk is hairy on all surfaces. The leaflets are asymmetrical at the base and are more coarsely toothed. The inflorescence is smaller, pyramid-shaped or egg-shaped, not flat-topped. It blooms from June to July. 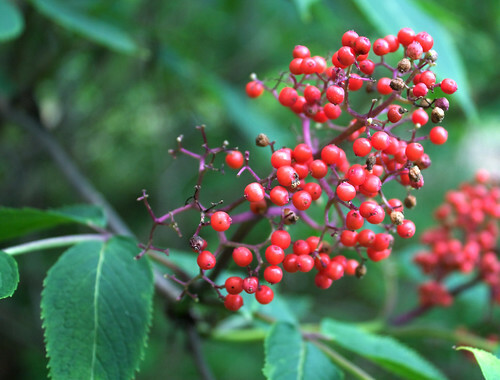 Mature berries are bright red. The fruit is safe but all other parts of the plant are poisonous. For jam, pies, wine. 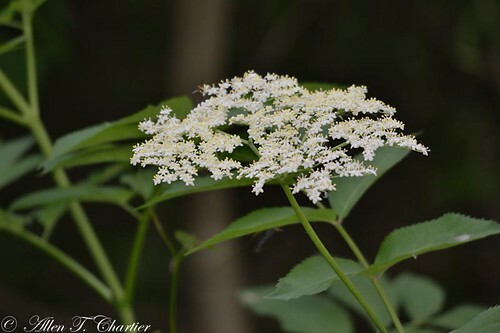 How to identify common elderberry and how to make elderberry juice. 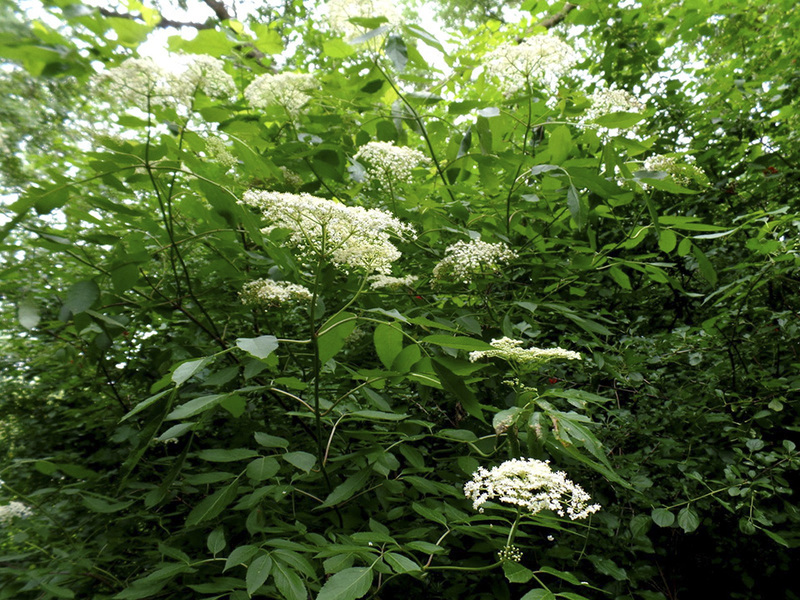 The elderberry is very nutritious and is also used as an antiviral to fight the flu but you must boil the berries first. 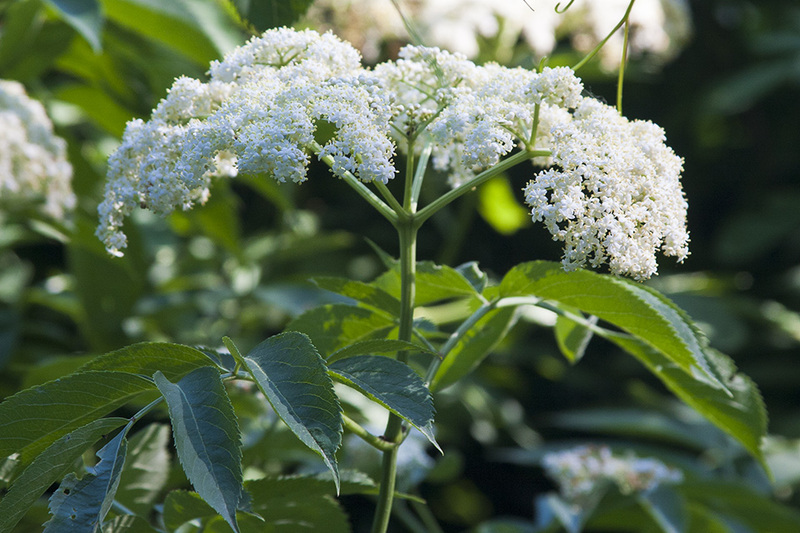 American Elderberry (Sambucus canadensis) is an attractive edible landscape plant for temperate climates. 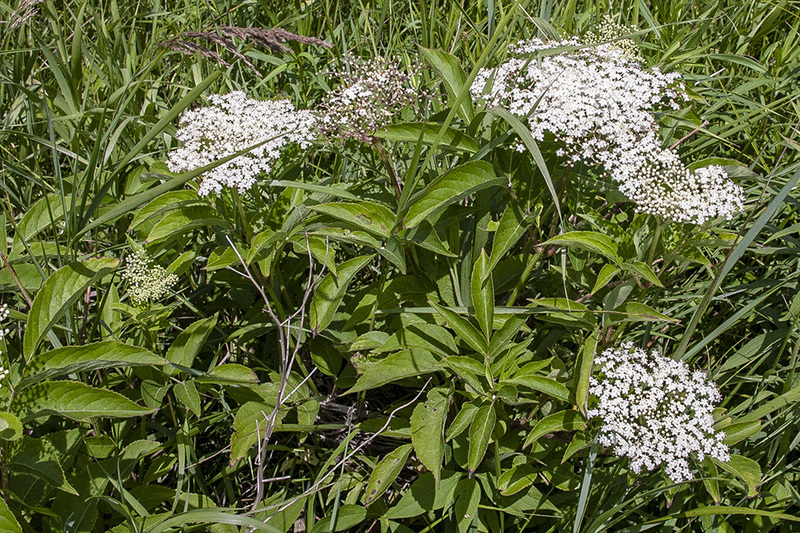 A native plant, its produces beautiful flowers much loved by native pollinators and delicious purple berries that can be made into tinctures, teas, pies, and wines. 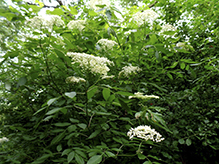 In this video, Dan Furman of Cricket Hill Garden introduces the growth habit, history, and some of the virtues of this worthy shrub. These plants are located on my personal property.